On this day in 1943, budding teenage ring phenomenon, Billy Arnold finished up his first year on the job with his 9th consecutive knockout. His victim this time was fellow Philadelphian Bob Winters. 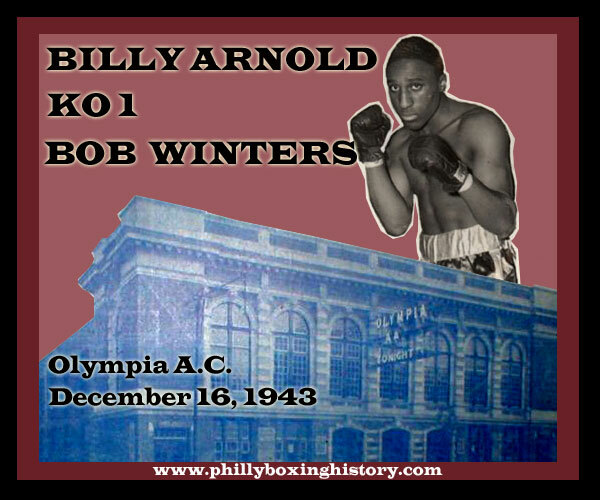 Arnold's KO came in the 1st round of a scheduled welterweight 4 rounder at the Olympia A.C. At this point in his career, Arnold never needed to go beyond the second round. His KO streak would continue into 1944 through another seven bouts, spanning 16 total. He fought 22 times in 1944, bringing his record to 30-0-1 with 28 KOs. Arnold did all of this while still in high school! The youngster started 1945 with a questionable points loss to Fritzie Zivic at the Garden. His next bout was the biggest of his career. After a strong start, Arnold fell to Rocky Graziano in the 3rd.